‘force majeure’ means any sudden, unforeseeable and inevitable event which endangers or prevents the exercise of normal fishing activities in the Liberian fishing zone. partnerships between operators aimed at developing economic activities in the fisheries sector and related activities, in the common interest. 1. The Parties hereby undertake to promote responsible fishing in the Liberian fishing zone as provided for in FAO's Code of Conduct for Responsible Fishing, on the basis of the principle of non-discrimination. 2. The Liberian authorities undertake not to give more favourable conditions than those accorded under this Agreement to other foreign fleets operating in the Liberian fishing zone which have the same characteristics and target the same species as those covered by this Agreement and the Implementing Protocol thereto (hereinafter referred to as ‘the Protocol’). Those conditions relate to the conservation, development and management of resources, financial arrangements, fees and rights relating to the issuing of fishing authorisations. 3. In the interest of mutual transparency, Liberia undertakes to render public any agreement authorising foreign fleets to fish in the waters under its jurisdiction. 4. The parties hereby undertake to implement this Agreement in accordance with Article 9 of the Cotonou Agreement concerning essential elements regarding human rights, democratic principles and the rule of law, and essential elements regarding good governance, following the procedure set out in Articles 8 and 96 thereof. 5. The Parties shall cooperate with a view to implementing a sectoral fisheries policy adopted by the Government of Liberia and to that end shall initiate a policy dialogue on the necessary reforms. They shall consult with a view to potentially adopting measures in this area. 6. The Parties hereby undertake to ensure that this Agreement is implemented in accordance with the principles of good economic and social governance, respecting the state of fish stocks. 7. The Declaration of the International Labour Organisation (ILO) on fundamental principles and rights at work shall be fully applicable to African, Caribbean and Pacific (hereinafter referred to as ‘ACP’) seamen signed on to Union vessels, in particular as regards the freedom of association and collective bargaining of workers and the elimination of discrimination in respect of employment and occupation. 8. The Parties shall consult one another prior to adopting any decision that may affect the activities of Union vessels under this Agreement. 1. Union vessels may fish in the Liberian fishing zone only if they are in possession of a fishing authorisation issued under this Agreement. Any commercial fishing activity outside the framework of this Agreement shall be prohibited. 2. The Liberian authorities shall not deliver authorisations to fish to Union vessels other than under this Agreement. The issuing of any fishing authorisations to Union vessels outside the framework of this Agreement, in particular in the form of private licences, shall be prohibited. 1. The activities of Union vessels operating in the Liberian fishing zone shall be subject to the applicable laws and regulations of Liberia, unless otherwise provided in the Agreement, the Protocol or the Annex. Liberia shall provide the Union authorities with its applicable laws and regulations. 2. Liberia undertakes to take all the appropriate steps required for the effective application of the fisheries monitoring, control and surveillance provisions in this Agreement. Union vessels shall cooperate with the Liberian authorities responsible for carrying out such monitoring, control and surveillance. 3. The Liberian authorities shall notify to the Union authorities any changes to existing legislation or new legislation with a potential impact on the activities of Union vessels. Such legislation shall be enforceable with respect to Union vessels from the sixtieth day following that on which the notification is received by the Union authorities. 4. The Union undertakes to take all the appropriate steps required to ensure that its vessels comply with this Agreement and the legislation governing fisheries in the waters under the sovereignty or jurisdiction of Liberia. 5. The Union authorities shall notify to the Liberian authorities any changes to Union legislation with a potential impact on the activities of Union vessels under this Agreement. reinforce Liberia's capacity to develop a sustainable fisheries policy through sectoral support. 2. The financial contribution for sectoral support shall be dissociated from the payments regarding access costs and shall be determined and conditioned by the achievements of the objectives of Liberia's sectoral support in accordance with the Protocol and the annual and multiannual programmes for its implementation. 3. The financial contribution granted by the Union shall be paid each year in accordance with the Protocol. the application of Article 14 of this Agreement. 1. The Parties shall encourage economic, scientific and technical cooperation in the fisheries sector and related sectors. They shall consult one another with a view to coordinating the different measures that might be taken to this end. 2. The Parties undertake to promote the exchange of information on fishing techniques, gear, preservation methods and the industrial processing of fisheries products. 3. The Parties shall endeavour, when appropriate, to create conditions favourable to the promotion of relations between their enterprises in the technical, economic and commercial spheres, by encouraging the establishment of an environment favourable to the development of business and investment. 4. The parties may undertake to implement a plan of actions between Liberia and Union vessels operators aimed at promoting fish landing from Union vessels operating in Liberia. 5. The Parties shall encourage, when appropriate, the setting-up of joint enterprises in their mutual interest which shall systematically comply with Liberian and the Union legislation. 1. A Joint Committee composed of representatives of the Union and the Liberian authorities shall be set up to monitor the application of this Agreement. The Joint Committee may adopt modifications to the Protocol, as well as the Annex thereto and its Appendices. 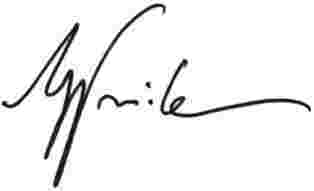 acting as a forum for the amicable settlement of any disputes regarding the interpretation or application of this Agreement. the technical conditions and modalities under which Union vessels carry out their fishing activities. 4. The Joint Committee shall exercise its functions in accordance with the objectives of this Agreement and with the relevant rules adopted by ICCAT and other RFMOs, where relevant. 5. The Joint Committee shall meet at least once a year, alternately in Liberia and in the Union, or as otherwise agreed by common accord, and shall be chaired by the Party hosting the meeting. It shall hold a special meeting at the request of either Party. Decisions shall be taken by consensus and shall be attached to the agreed minutes of the meeting. They shall enter into force on the date on which the Parties notify each other of the completion of the procedures necessary for their adoption. 6. The Joint Committee may adopt its own rules of procedure. The Parties undertake to fight in close collaboration against illegal, unreported and unregulated (IUU) fishing with a view to the implementation of responsible and sustainable fishing. 1. The Parties shall encourage scientific cooperation to regularly assess the status of fish stocks in Liberia's waters. 2. The Parties undertake to consult one another, if necessary, in a joint scientific meeting and in ICCAT and other relevant RFMOs to reinforce the management and conservation of marine biological resources in the Liberian fishing zone and to cooperate in the relevant scientific research. This Agreement shall apply, on the one hand, to the territories in which the Treaty on the Functioning of the European Union is applied and under the conditions laid down in that Treaty, and, on the other, to the territory of Liberia and to the waters under the jurisdiction of Liberia. This Agreement shall apply for five years from the date of the start of its provisional application. It shall be tacitly renewed, unless notice of termination is given in accordance with Article 14. The Protocol, the Annex thereto and its Appendices shall form an integral part of this Agreement. failure by either of the Parties to comply with the provisions of this Agreement, in particular Article 3(4) on the respect of human rights. 2. Suspension of the application of this Agreement shall be notified in writing by the interested Party to the other Party and shall take effect three months after receipt of the notification. The Parties shall consult each other from the moment of notification of suspension with a view to finding an amicable settlement to their dispute within three months. Where such settlement is reached, implementation of this Agreement shall resume and the amount of the financial contribution referred to in Article 6 shall be reduced proportionately and pro rata temporis according to the duration of the suspension. failure to comply with undertakings made by the Parties with regard to combating IUU fishing. 2. Termination of this Agreement shall be notified in writing by the interested Party to the other Party and shall take effect six months after receipt of notification, except if the Parties decide by common accord to extend this period. The Parties shall consult each other from the moment of notification of termination with a view to finding an amicable settlement to their dispute within the six month period. 3. In the event of termination, payment of the amount of the financial contribution referred to in Article 6 for the year in which the termination takes effect shall be reduced proportionately and pro rata temporis. Signature of this Agreement by the Parties entails its provisional application prior to its entry into force. It shall enter into force when the Parties have notified each other of the completion of the necessary procedures. Съставено в Брюксел на девети декември две хиляди и петнадесета година. Hecho en Bruselas, el nueve de diciembre de dos mil quince. V Bruselu dne devátého prosince dva tisíce patnáct. Udfærdiget i Bruxelles den niende december to tusind og femten. Geschehen zu Brüssel am neunten Dezember zweitausendfünfzehn. Kahe tuhande viieteistkümnenda aasta detsembrikuu üheksandal päeval Brüsselis. Έγινε στις Βρυξέλλες, στις εννέα Δεκεμβρίου δύο χιλιάδες δεκαπέντε. Done at Brussels on the ninth day of December in the year two thousand and fifteen. Fait à Bruxelles, le neuf décembre deux mille quinze. Sastavljeno u Bruxellesu devetog prosinca dvije tisuće petnaeste. Fatto a Bruxelles, addì nove dicembre duemilaquindici. Briselē, divi tūkstoši piecpadsmitā gada devītajā decembrī. Priimta du tūkstančiai penkioliktų metų gruodžio devintą dieną Briuselyje. Kelt Brüsszelben, a kétezer-tizenötödik év december havának kilencedik napján. Magħmul fi Brussell, fid-disa’ jum ta’ Diċembru fis-sena elfejn u ħmistax. Gedaan te Brussel, de negende december tweeduizend vijftien. Sporządzono w Brukseli dnia dziewiątego grudnia roku dwa tysiące piętnastego. Feito em Bruxelas, em nove de dezembro de dois mil e quinze. Întocmit la Bruxelles la nouă decembrie două mii cincisprezece. V Bruseli deviateho decembra dvetisícpätnásť. V Bruslju, dne devetega decembra leta dva tisoč petnajst. Tehty Brysselissä yhdeksäntenä päivänä joulukuuta vuonna kaksituhattaviisitoista. Som skedde i Bryssel den nionde december år tjugohundrafemton. (2) Agreement amending the Partnership Agreement between the members of the African, Caribbean and Pacific Group of States, of the one part, and the European Community and its Member States, of the other part, signed in Cotonou on 23 June 2000 (OJ L 209, 11.8.2005, p. 27). (3) Agreement amending for the second time the Partnership Agreement between the members of the African, Caribbean and Pacific Group of States, of the one part, and the European Community and its Member States, of the other part, signed in Cotonou on 23 June 2000, as first amended in Luxembourg on 25 June 2005 (OJ L 287, 4.11.2010, p. 3). Highly migratory species (species listed in Annex 1 to the 1982 United Nations Convention on the Law of the Sea). 3. Paragraph 1 of this Article shall apply subject to Articles 6 and 7 of this Protocol. 4. In accordance with Article 4 of the Agreement, Union vessels may engage in fishing activities in the Liberian fishing zone only if they are in possession of a fishing authorisation issued under this Protocol in accordance with the Annex thereto. This Protocol and the Annex thereto shall apply for a period of five years from the date of provisional application. 1. For the period referred to in Article 2, the financial contribution referred to in Article 6 of the Agreement shall be EUR 3 250 000.
a specific annual amount for the support of the implementation of Liberia's sectoral fisheries policy of EUR 357 500 for the first year, of EUR 325 000 in the second, third and fourth years, and of EUR 292 500 for the fifth year. 3. Paragraph 1 shall apply subject to Articles 4, 5, 6, 7 and 8 of this Protocol and Articles 13 and 14 of the Agreement. 4. If the annual level of catches from Union vessels in the Liberian fishing zone exceeds the annual reference tonnage referred to in point (a) of paragraph 2, the total amount of the financial contribution shall be increased by EUR 55 for the first year, by EUR 50 for the second, third and fourth years and by EUR 45 for the fifth year for each additional tonne caught. 5. However, the total annual amount paid by the Union shall not be more than twice the amount indicated in point (a) of paragraph 2. Where the quantities caught by Union vessels exceed the quantities corresponding to twice the total annual amount, the amount due for the quantity exceeding that limit shall be paid in the following year. 6. Payment of the financial contribution laid down in point (a) of paragraph 2 on access by Union vessels to Liberian fishery resources shall be made by the Union no later than three months after the start of the provisional application for the first year and, for the following years, no later than the anniversary date of the provisional application of this Protocol. 7. The Liberian authorities shall have full discretion regarding the use to which the financial contribution referred to in point (a) of paragraph 2 is put. 8. The financial contribution referred to in paragraph 2 shall be paid into a Public Treasury account opened with the Central Bank of Liberia. The financial contribution referred to in point (b) of paragraph 2 shall be made available to the Ministry of Agriculture of Liberia. The bank account details shall be provided annually by the Liberian authorities to the Union authorities. criteria and procedures including, where appropriate, budgetary and financial indicators for evaluating the results obtained each year. 2. The use of the specific amount of the financial contribution referred to in point (b) of Article 3(2) shall be based on the identification by the Joint Committee of the objectives to be achieved and the annual and multiannual programmes to attain them. 3. Any proposed amendments to the multiannual sectoral programme shall be agreed on by the Joint Committee. Urgent changes to the annual sectoral programme required by Liberian authorities may be done through the Joint Committee, including through exchange of letters. 4. Each year, Liberia shall present a progress report on the actions implemented and the results achieved with sectoral support, which shall be examined by the Joint Committee. Liberia shall also produce a final report before expiry of the present Protocol. 5. The specific amount of the financial contribution referred to in point (b) of Article 3(2) shall be paid in instalments. For the first year of this Protocol, the instalment shall be paid on the basis of the needs identified as part of the agreed programmes. For the subsequent years of application, the instalments shall be paid on the basis of the needs identified as part of the agreed programmes and on the basis of an analysis of the results achieved in the implementation of the sectoral support. In the event of failure to implement this financial contribution as determined by the Joint Committee. 7. Payment of the financial contribution shall resume after consultation between the parties and agreement by the Joint Committee when it is justified on the basis of the results of the implementation of the agreed programmes referred to in paragraph 1. Nevertheless, the specific financial contribution provided for in point (b) of Article 3(2) may not be paid out beyond a period of six months after this Protocol expires. 8. Each year, Liberia may allocate an amount over and above the financial contribution referred to in point (b) of Article 3(2) with a view to implementing the multiannual programme. This allocation shall be notified to the Union no later than two months after the anniversary date of this Protocol. 9. The Parties undertake to ensure the visibility of the measures implemented with sectoral support. 1. The Parties hereby undertake to promote responsible fishing in the Liberian fishing zone based on the principle of non-discrimination between the different fleets which have the same characteristics and target the same species as those covered by this Protocol. 2. Over the period covered by this Protocol, the Parties undertake to cooperate in monitoring the state of fisheries resources in the Liberian fishing zone in order to inform sustainable fishery management. 3. The Parties shall comply with the recommendations and resolutions of the International Commission for the Conservation of Atlantic Tunas (ICCAT) and take into account the scientific advice of other relevant regional organisations. 4. The Parties undertake to hold, as needed, joint scientific meetings with a view to examine any scientific matter regarding the implementation of this Protocol. The terms of reference of such joint scientific meetings may be established by the Joint Committee. 5. Based on the recommendations and resolutions taken within ICCAT and the best available scientific advice and, where appropriate, the conclusions of the joint scientific meeting, the Joint Committee may adopt a decision on measures to ensure sustainable management of the fisheries resources covered by this Protocol as far as the activities of Union vessels are concerned. 1. The Joint Committee may reassess and decide to review the fishing opportunities referred to in Article 1 insofar as the recommendations and resolutions adopted within the ICCAT confirm that such a review will secure the sustainable management of the fisheries resources covered by this Protocol. In this case, the financial contribution referred to in point (a) of Article 3(2) shall be adjusted proportionately and pro rata temporis by decision of the Joint Committee. However, the total annual amount paid by the Union shall not be more than twice the figure indicated in point (a) of Article 3(2). 2. The Joint Committee may also, as necessary, examine and decide to adopt by mutual agreement technical provisions of this Protocol and the Annex thereto. 1. At the request of one of the Parties, the Joint Committee may consider the possibility of experimental fishing campaigns in the Liberian fishing zone with a view to test the technical feasibility and economic viability of new fisheries not provided for in Article 1. To this end, the Joint Committee shall determine on a case by case basis the species, the conditions and any other relevant parameters. 2. Taking into account the best available scientific advice and on the basis of the results of the experimental campaigns, if the Union becomes interested in new fishing opportunities, the Joint Committee shall convene to discuss and prescribe the conditions applicable to such new fishing activities. 3. Following authorisation by Liberia for those new fishing activities, the Joint Committee shall make corresponding amendments to this Protocol and the Annex thereto. 1. The implementation of this Protocol, including payment of the financial contribution as referred to in points (a) and (b) of Article 3(2) of this Protocol, may be suspended on the initiative of either of the Parties in the cases and under the conditions referred to in Article 13 of the Agreement. 2. Without prejudice to Article 4 of this Protocol, payment of the financial contributions shall resume as soon as the situation existing prior to the events mentioned in Article 13 of the Agreement has been re-established. This Protocol may be terminated on the initiative of either of the Parties in the cases and under the conditions referred to in Article 14 of the Agreement. 1. Liberia and the Union undertake to implement the necessary systems for the electronic exchange of all information and documents related to the implementation of the Agreement and this Protocol. 2. The electronic form of a document at any point shall be considered equivalent to the paper version. 3. In the event of any disruption to a computer system that impedes such exchanges, the Party affected shall immediately notify the other Party. In those circumstances, the information and documents related to the implementation of the Agreement and this Protocol shall be replaced automatically by their paper version in the manner defined in the Annex. 1. Liberia and the Union undertake to ensure that all commercially sensitive data related to the Union vessels and their fishing activities obtained in the framework of the Agreement and this Protocol shall be treated at all times in conformity with their respective confidentiality and data protection principles. 2. The Parties shall ensure that only aggregated data for fishing activities of the EU fleet in the Liberian fishing zone shall be made public, in conformity with the corresponding provisions of the ICCAT and other regional fisheries management organisations (RFMOs). Data which may be considered as otherwise confidential shall be used exclusively for the implementation of the Agreement and for the purposes of fisheries management, monitoring, control and surveillance. Signature of this Protocol by the Parties entails its provisional application prior to its entry into force. This Protocol shall enter into force when the Parties have notified each other of the completion of the necessary procedures. for Liberia: the Ministry of Agriculture (hereinafter referred to as ‘MOA’). The geographic coordinates of the Liberian fishing zone as defined in point (g) of Article 1 of the Agreement and the baselines are described in Appendix 5 to this Annex. Zones closed to fishing, in line with the national legislation in force, such as national parks, marine protected areas and fish breeding grounds, as well as areas closed to shipping are described in Appendix 5 to this Annex. Liberia shall notify the vessel-owners of the coordinates of those zones when the fishing authorisation is issued. Liberia shall notify the Union, at least two months before enforcement, of any changes to the zones closed to shipping and fishing. Before the provisional application of the Protocol, Liberia shall notify the Union of the details of the Government bank account(s) into which the financial sums payable by Union vessels under the Agreement must be paid. The associated bank transfer costs shall be borne by the vessel owners. The contact details of the Liberian authorities are included in Appendix 7 to this Annex. Only eligible vessels may obtain an authorisation to fish in the Liberian fishing zone. 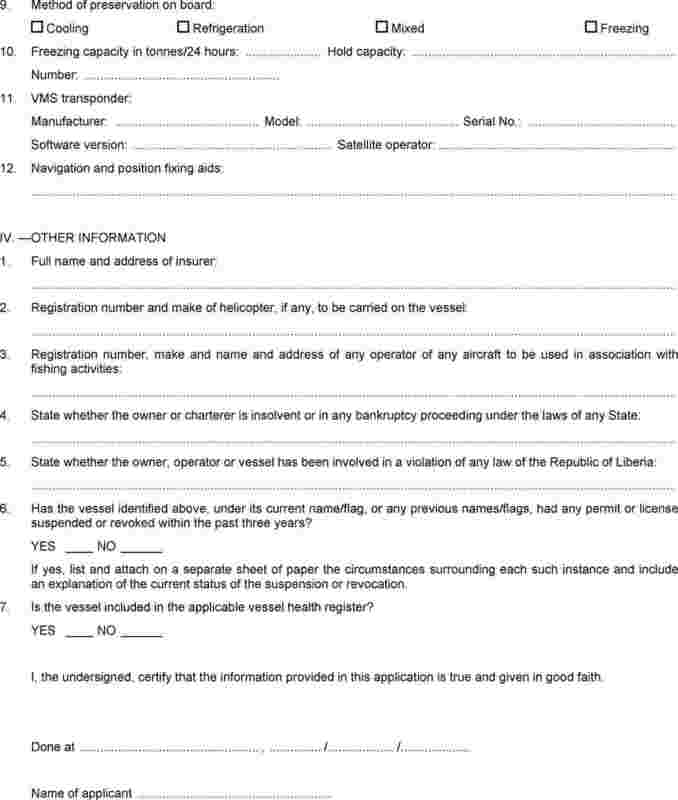 For a vessel to be eligible, neither the owner, the master nor the vessel itself must be prohibited from fishing in Liberia. They must be in order vis-à-vis the Liberian authorities insofar as they must have fulfilled all prior obligations arising from their fishing activities in Liberia under fisheries agreements concluded with the Union. Vessels must also be included in the EU register of fishing vessels, in the ICCAT record of vessels, and not on the IUU listing of ICCAT or any other RFMOs. The Union shall submit, by electronic means, to Liberia, with a copy to the EU Delegation to Liberia, an application for any vessel wishing to fish under the Agreement at least 15 calendar days before the date of commencement of the period of validity requested. The originals are to be sent directly by the Union to Liberia with a copy to the EU Delegation to Liberia. an illustration and detailed description of the fishing gears used. 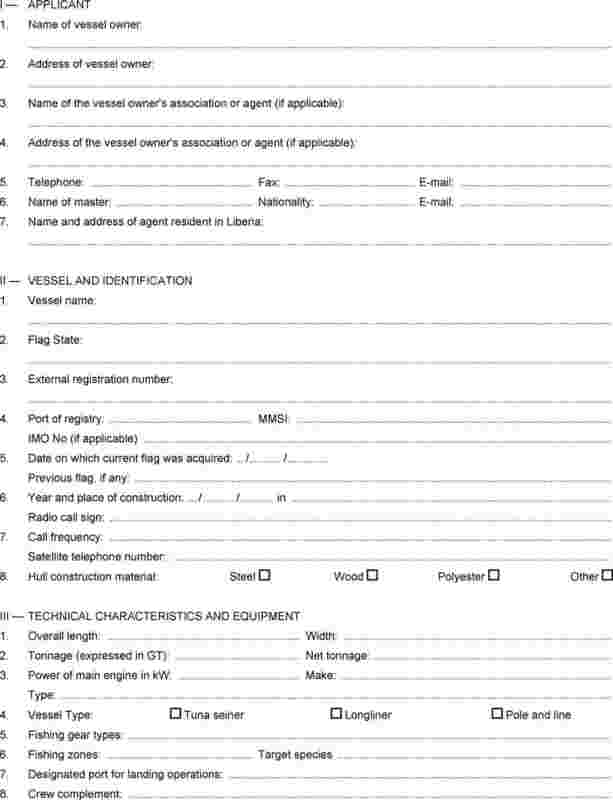 The information provided in the application form referred to in point 4 will be used by the competent Liberian authorities to process and issue the Liberia Maritime Authority certificate of number within the period referred to in point 3. The Liberia Maritime Authority certificate of number should be issued before the issuing of the fishing authorisation by the Liberian competent authorities. As part of their first application for a fishing authorisation under the Protocol, all Union vessels shall undergo a pre-authorisation inspection. The issuing of the first fishing authorisation shall be conditional on the succesful completion of this inspection, which shall be carried out in designated ports in the sub-region agreed between the Union and Liberia, subject to authorisation by the Port State concerned. Any inspections taking place outside of the Port of Monrovia shall be done with all associated costs to be borne by the vessel-owner. For the renewal of a fishing authorisation under the Protocol in force for a vessel whose technical specifications have not been modified, the renewal application shall be accompanied only by proof of payment of the fees which are non-refundable. In the event where the technical specifications have been modified, the application shall be re-submited with all relevant documents as specified in point 4 and the issuing of the fishing authorisation shall be subject to the succesful completion of a new pre-authorisation inspection. In the event that Liberia has not obtained authorisation from the Port State concerned to carry out the inspection, the vessel-owner shall be automatically absolved of the obligation to undergo the pre-authorisation inspections referred to in points 6 and 7. Liberia shall issue the fishing authorisations to vessel owners or inform the Union of its refusal within 15 calendar days of receipt of all the documents referred to in point 4. The original of the fishing authorisation shall be sent to the vessel owners or their agents via the Union. If the Union offices are closed, Liberia may send the fishing authorisation directly to the vessel owner or his agent with a copy to the Union. At the same time, in order not to delay the possibility of fishing, a copy of the fishing authorisation shall be transmitted electronically to the Union, for forwarding to the vessel owner, and to the EU Delegation for information. This copy may be used for a maximum period of 60 calendar days after the issuing date of the fishing authorisation. During this period, the copy shall be considered equivalent to the original. The original of the fishing authorisation shall be held on board at all times, without prejudice to the provisions of point 10. After the fishing authorisation is issued, Liberia shall include immediately the Union vessel in the list of vessels which are authorised to fish in the Liberian fishing zone. This list shall be sent immediately to the Monitoring Control and Surveillance Unit (MCSU), the National Fisheries Monitoring Center (NFMC) and MOA of Liberia and to the Union. Liberia shall update regularly the list of vessels authorised to fish. The new list shall be sent without delay to the MCSU, NFMC and MOA of Liberia, and to the Union. In the event the fishing authorisation is not issued within the timeframe specified in point 9, the vessel shall be included in the list on a provisional basis, unless there is clear evidence that it does not comply with the requirements of point 2. During this time, the vessel shall be authorised to fish. Fishing authorisations shall be issued for a specific vessel and shall not be transferable. However, at the request of the Union and where force majeure is proven, in particular in the event of the loss or prolonged immobilisation of a vessel due to a serious technical failure, a fishing authorisation shall be replaced by a new authorisation for another vessel of the same fishing category as the vessel being replaced, subject to the submission of a new fishing authorisation application as required under point 4 and the succesful completion of a pre-authorisation inspection as required under point 6 but with no further fee due. In this case, the calculation of the catch levels to determine whether an additional payment should be made shall take account of the sum of the total catches of the two vessels. The vessel owner or his agent shall return the cancelled fishing authorisation to Liberia via the EU Delegation to Liberia. The new fishing authorisation shall take effect on the day on which the cancelled authorisation is returned. The EU Delegation to Liberia shall be informed of the transfer of the fishing authorisation. Liberia shall update the list of vessels authorised to fish and shall send it without delay to the MCSU, NFMC and MOA of Liberia, and to the Union. Fishing authorisations shall be valid for an annual period and be renewable. 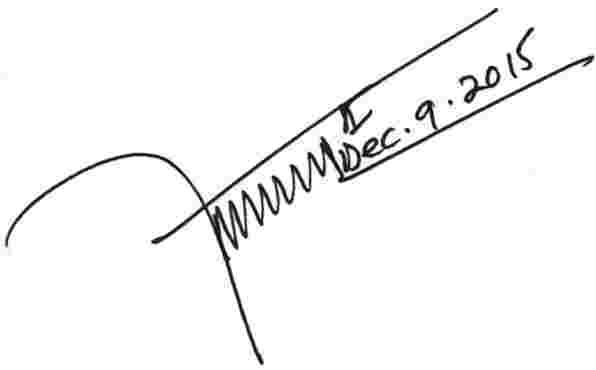 for the last year of application of the Protocol, the period between 1 January and the date of expiry of the Protocol. For the first and last years of application of the Protocol, the advance fee referred to in Section 2 shall be calculated pro rata temporis. the documents referred to in point 4. EUR 70 per tonne for the fifth year of application. EUR 2 200 per vessel, equivalent to the fees due for 31,43 tonnes per year for the fifth year of application of the Protocol. The advance fee shall include all national and local charges except for port taxes and service charges. Where the period of validity of the fishing authorisation is less than one year, the amount of the advance fee shall be adapted pro-rata temporis to the duration of the period of validity requested. If the final statement of fees is higher than the advance fee paid by the vessel-owner for obtaining the fishing authorisation, the vessel-owner shall pay the balance to Liberia no later than 30 September of the year following which the catches were made. Where the final statement is less than the advance fee referred to in point 2, the balance shall not be recoverable by the shipowner. Liberia shall authorise Union vessels which are holders of a fishing authorisation to be assisted by support vessels. The support vessels shall fly the flag of a Member State of the Union, and shall not be equipped for catching fish or be used for transhipments. Liberia shall define its support activities and the conditions for obtaining authorisations and shall draw up a list of authorised support vessels and send it without delay to the national body for controlling fishing and to the Union. The annual authorisation fee applicable to the support vessel is EUR 3 000 per vessel. Conservation technical measures applicable to the vessels holding a fishing authorisation, relating to the fishing zone, fishing gear and additional catch, shall be defined for each fishing category in the technical sheets contained in Appendix 2 to this Annex. The vessels shall comply with all the recommendations adopted by ICCAT and the provisions under the relevant Liberian legislation. The use of drifting fish aggregating devices (FADs) in the Liberian fishing zone shall be limited to artificial supports with non-entangling underwater hanging structures. The deployment and use of such artificial drifting FADs shall be subject to the adoption by the Union of a management plan in line with the provisions adopted by ICCAT. Union vessels shall conduct all fishing activities in a manner which will not disrupt traditional, local-based fisheries, and shall release all turtles, marine mammals, seabirds and reef fish in a manner which will provide this miscellaneous catch with the greatest chance of survival. Union vessels, their masters and operators shall conduct all fishing operations in a manner, which will not disrupt the fishing activities of other fishing vessels and shall not interfere with the fishing gear of other fishing vessels. The master of an Union vessel fishing under the Agreement shall keep a fishing logbook, for which the model for each category of fishing is included in Appendix 3 to this Annex. The fishing logbook shall be completed by the master for each day the vessel is present in the Liberian fishing zone. Each day the master shall record in the fishing logbook the quantity of each species, identified by its FAO alpha 3 code, caught and kept on board, expressed in kilograms of live weight or, where necessary, the number of individual fish. For each main species, the master shall also include the bycatch. such other information as may be decided by the Joint Committee. If no sets were made by a vessel for a particular day, or if a set is made and no fish are caught, the vessel master shall be required to record this information on the daily log sheet form. On days when no fishing operations are conducted, by midnight local time of that day, the vessel must record on the logbook the fact that no operations were conducted. Time and date of entries in and departures from the Liberia fishing zone shall be recorded in the logbook immediately after entry in and departure from the Liberia fishing zone. The fishing logbook shall be filled in legibly, in block capitals, and signed by the master. The master shall notify the vessel's catch by submitting its fishing logbooks for the period of its presence in the Liberian fishing zone to the Bureau of National Fisheries (BNF). when leaving the Liberian fishing zone without first passing through a Liberian port, each fishing logbook shall be sent within a period of 14 calendar days after arrival in any other port, and in any case within a period of 30 calendar days after leaving the Liberian fishing zone. The Parties shall make every effort to establish a system for the electronic exchange of all the data, in view of accelerating its transmission. As soon as it is possible for catch declarations to be sent by e-mail, the master shall send the fishing logbooks to Liberia at the e-mail address given by Liberia. Liberia shall confirm receipt thereof immediately by return e-mail. IPMA (Instituto Português do Mar e da Atmosfèra). The return of the vessel into the Liberian fishing zone within the period of validity of its fishing authorisation shall give rise to further catch reporting. Where the provisions concerning catch reporting are not complied with, Liberia may suspend the fishing authorisation of the vessel concerned until the missing catch report is obtained and penalise the vessel owner in accordance with the relevant provisions under the national legislation in force. If the offence is repeated, Liberia may refuse to renew the fishing authorisation. Liberia shall inform the Union immediately of any penalty applied in this context. The Parties indicate their shared willingness to ensure a transition to an electronic system for declaring catches based on the technical characteristics laid down in Appendix 6 to this Annex. The parties agree to determine together the transmission arrangements with the aim of the system becoming operational as soon as possible. Liberia shall inform the Union as soon as the conditions for this transition have been met. From the date this information is sent, the Parties shall agree to have the system fully operational within two months. Until the electronic system for declaring catches referred to under point 16 is in place, Member States of the Union shall inform the European Commission, not later than 15 calendar days from the end of each quarter, of the tonnages caught during the past quarter, as validated by their national administrations and confirmed by the scientific institutes referred to in point 13. The scientific institutes shall conduct an analysis of the catch data by cross-checking the available data in the fishing logbooks, landing declarations, sales declarations and, where applicable, scientific observation reports. On this basis, the Union shall draw up, for each vessel authorised to fish in the Liberian fishing zone, a quarterly catch declaration broken down per species and per month, in accordance with the template provided in Appendix 8 to this Annex. The aggregated data originating from the fishing logbooks shall be considered provisional until notification by the Union of the final statement of fees referred to in point 23. Until the electronic system for declaring catches referred to under point 16 is in place, Member States of the Union shall inform the European Commission, not later than 15 May each year, of the tonnages caught during the past year, as validated by their national administrations and confirmed by the scientific institutes referred to in point 13. The scientific institutes shall conduct an analysis of the catch data by cross-checking the available data in the fishing logbooks, landing declarations, sales declarations and, where applicable, scientific observation reports. The methodology used by the Union's scientific institutes to analyse the level and composition of the catches in the Liberian fishing zone shall be shared with the BNF. On the basis of the catch declarations referred to in point 19, the Union shall draw up for each vessel authorised to fish in the Liberian fishing zone in the previous year a final statement of the fees due for the vessel in respect of its annual fishing campaign for the previous calendar year. The Union shall send this final statement of fees simultaneously to Liberia and to the vessel owners via the Member States of the Union before 30 June of the year in progress. Liberia shall notify the Union of receipt of the statement and may request from the Union any clarifications it deems necessary. In this case, the Union shall consult the national administrations of the flag-States and the Union's scientific institutes and shall make every effort to provide to Liberia any additional information needed. Where applicable, a dedicated joint scientific meeting may be organised in order to examine the catch data and the methodologies used for cross-checking information. Liberia may contest the final annual catch declaration and the final statement of fees within 30 calendar days after the notification given under point 24, on the basis of documentary proof. In the case of disagreement, the Parties shall consult each other in the Joint Committee. If Liberia does not object within the aforementioned period, the final statement of fees shall be considered to be adopted. The landing operation must be carried out in the fishing zone of a Liberian port authorised for this purpose. Non-compliance with the provisions regarding the landing procedure shall lead to the application of the relevant penalties provided for under Liberian legislation. Union vessels shall endeavour to supply tuna to the local industry at the international market price. Until such time as the Mesurado pier in Liberia becomes operational, a Union vessel which holds a fishing authorisation in accordance with the terms set out in this Protocol and which lands its tuna catches in a Liberian designated port, shall benefit from a financial incentive in the form of a reduction in the fee of EUR 10 per tonne of bycatch landed in the case of sale of the catch to a Liberian fishing enterprise for supply to the Liberian market. This mechanism shall be limited to maximum 50 % of the final catches reported. When the Mesurado fisheries terminal becomes operational, Union vessels shall benefit from the financial incentive in the form of partial reduction in the fee of EUR 10 per tonne landed. An additional reduction in the fee of EUR 10 per tonne landed shall be given in the case of sale to the local industry. With regards to bycatch a special reduction in the fee of EUR 25 per tonne of bycatch landed will be given when the catch is sold to the local market. This mechanism shall be limited to the maximum of 50 % of the final tuna catches reported. The transhipment operation shall be carried out in a Liberian port authorised for this purpose in the presence of Liberian inspectors. In order to avoid delays, in exceptional cases where the presence of a Liberian inspector is not possible, the master shall be authorised to commence transhipment after expiration of the notice period given in accordance with point 6. Transhipment at sea is prohibited. Transhipment shall be considered an exit from the Liberian fishing zone as defined in Section 3. Vessels must therefore submit their catch declarations to the competent authorities no later than 24 hours after completion of the transhipment or in any event at least 6 hours before the donor vessel leaves port whichever occurs first and the vessel owner shall state whether he intends to continue fishing or leave the Liberian fishing zone. For the receiving vessel, the reporting requirements of the applicable Liberian legislation shall apply. Liberia must be notified of any Union vessel holding a fishing authorisation which enters or exits the Liberian fishing zone at least six hours before the entry or exit. Notification shall be given preferably by e-mail or, failing that, by fax or radio, to an e-mail address, a telephone number or a frequency communicated by Liberia as specified in Appendix 7 to this Annex. Liberia shall confirm receipt thereof immediately by return e-mail. Liberia shall immediately inform the vessels concerned and the Union of any change to the e-mail address, telephone number or transmission frequency. Any Union vessel found to be fishing in the Liberian fishing zone without having previously notified its presence shall be considered to be a vessel fishing illegally. Inspection at sea in the Liberian fishing zone of Union vessels holding a fishing authorisation shall be carried out by vessels and inspectors from Liberia who are clearly identified as being assigned to carry out fishing checks. Before going on board, the Liberian inspectors shall inform the Union vessel of their decision to carry out an inspection. The master of the Union vessel shall allow and facilitate the Liberian inspectors to come on board and carry out their work. The inspection shall be carried out by a maximum of five inspectors, who must provide proof of their identity and official position as an inspector before carrying out the inspection. The master shall immediately comply with all reasonable instructions given by the authorized officers, and shall facilitate safe boarding, and facilitate the inspection of the vessel, gear, equipment, records, fish, fish products and documentation related to the crew. The vessel's master or crew shall not assault, obstruct, resist, delay, refuse boarding, intimidate, interfere with an authorized officer in the performance of duties. The Liberian inspectors shall only stay on board the Union vessel for the time necessary to carry out tasks linked to the inspection. They shall carry out the inspection in a way which minimises the impact on the vessel, its fishing activity and cargo. Liberia may authorise the Union to participate in the inspections as an observer. At the end of each inspection, the Liberian inspectors shall draw up an inspection report. The master of the Union vessel shall have the right to include his comments in the inspection report. The inspection report shall be signed by the inspector drawing up the report and the master of the Union vessel. The signature of the inspection report by the master shall be without prejudice to the vessel owner's right of defence in respect of an infringement. If the master refuses to sign this document, he or she shall specify the reasons for doing so in writing and the inspector shall write ‘refusal to sign’ on it. The Liberian inspectors shall give a copy of the inspection report to the master of the Union vessel before leaving the vessel. Liberia shall send a copy of the inspection report to the Union within eight calendar days of the inspection. Inspection in or off port of Union vessels holding a fishing authorisation which land catch from the Liberian fishing zone in a port in the sub-region designated by common agreement between the Union and Liberia shall be carried out by vessels and inspectors from Liberia who are clearly identified as being assigned to carry out fishing checks, subject to authorisation of the Port State concerned. The signature of the inspection report by the master shall be without prejudice to the vessel owner's right of defence in respect of an infringement. If the master refuses to sign this document, he or she shall specify the reasons for doing so in writing and the inspector shall write 'refusal to sign' on it. The Liberian inspectors shall give a copy of the inspection report to the master of the Union vessel before leaving the vessel. Liberia shall send a copy of the inspection report to the Union within eight calendar days of the inspection. In order to strengthen the fight against IUU fishing, masters of Union vessels shall report the presence of any vessels in the Liberian fishing zone engaged in activities which may constitute IUU fishing, seeking for as much information as possible about what has been sighted. Sighting reports shall be sent without delay to the MCSU, NFMC and MOA of Liberia and the competent authority of the Union Member State of the sighting vessel, which shall immediately transmit them to the Union or to the body designated by it. Liberia shall send the Union any sighting reports it has on fishing vessels engaged in activities which may constitute IUU fishing in the Liberian fishing zone. Whilst they are in the Liberian fishing zone, Union vessels holding a fishing authorisation must be equipped at all times with a satellite monitoring system (Vessel Monitoring System — VMS) to enable automatic and continuous communication of their position, every two hours, to the fishing control centre (Fisheries Monitoring Centre — FMC) of their flag State. the speed and the course of the vessel. Each position message must be configured in accordance with the format included in Appendix 4 to this Annex. The first position recorded after entry into the Liberian fishing zone shall be identified by the code ‘ENT’. All subsequent positions shall be identified by the code ‘POS’, with the exception of the first position recorded after exit from the Liberian fishing zone, which shall be identified by the code ‘EXI’. The master shall ensure at all times that the VMS of his vessel is fully operational and that the position messages are correctly transmitted to the FMC of the flag State. In the event of breakdown, the VMS of the vessel shall be repaired or replaced within ten days. After that period, the vessel shall no longer be authorised to fish in the Liberian fishing zone. Vessels fishing in the Liberian fishing zone with a defective VMS must communicate their position messages by e-mail, radio or fax to the FMC of the flag State, at least every four hours, and must provide all the compulsory information. The FMC of the flag State shall automatically send the position messages of the vessels concerned to the FMC of Liberia. The FMCs of the flag State and Liberia shall exchange their contact e-mail addresses and inform each other without delay of any change to those addresses. The transmission of position messages between the FMCs of the flag State and Liberia shall be carried out electronically using a secure communication system. The FMC of Liberia shall inform the FMC of the flag State and the Union of any interruption in the reception of consecutive position messages from a vessel holding a fishing authorisation, where the vessel concerned has not notified its exit from the zone. Liberia shall ensure the compatibility of its electronic equipment with that of the FMC of the flag State and inform the Union immediately of any malfunction as regards the communication and reception of position messages with a view to finding a technical solution as soon as possible. The Joint Committee shall deal with any possible dispute arising. The master shall be considered responsible for any proven tampering with a vessel's VMS aimed at disturbing its operation or falsifying its position messages. Any infringements shall be subject to the penalties provided for by the Liberian legislation in force. On the basis of documentary evidence proving an infringement, Liberia may ask the FMC of the flag State, copying in the Union, to reduce the interval for sending position messages from a vessel to every thirty minutes for a set period of investigation. This documentary evidence must be sent without delay by Liberia to the FMC of the flag State and to the Union. The FMC of the flag State shall immediately send the position messages to Liberia at the new frequency. At the end of the set investigation period, Liberia shall immediately inform the FMC of the flag State and the Union and subsequently inform them of any follow-up. Vessels holding a fishing authorisation shall be subject to a scheme for observing their fishing activities carried out within the framework of the Agreement. This observation scheme shall conform to the recommendations adopted by ICCAT. Until such time as the new ICCAT Regional Observer Programme becomes operational, the following provisions on observers shall apply. The BNF shall designate the Union vessels which must allow an observer to embark and the observer assigned to them at the latest 15 calendar days before the date provided for the embarkation of the observer. Union vessels shall, at the request of the Liberian authorities, take on board one observer in order to reach the cover rate of 15 % of authorised vessels. The BNF shall draw up a list of vessels designated to take an observer on board and a list of the appointed observers. Those lists shall be kept up to date. They shall be forwarded to the Union as soon as they have been drawn up and every three months thereafter when they have been updated. When the fishing authorisation is issued, the BNF shall inform the Union and the vessel owner, or his agent, of the designated vessels and the observers which will be present on board each vessel. The time and port of embarkation, which may be a non-Liberian port, shall be chosen by the vessel-owner. The BNF shall immediately inform the Union and the vessel owner or his agent of any change in the designated vessels and observers. The BNF shall endeavour not to designate observers for vessels which already have an observer on board, or which are already formally obliged to allow an observer to embark during the fishing season in question as part of their activities in fishing zones other than the Liberian fishing zone. The time spent on board by observers shall be one fishing trip or, at the express request of the vessel-owner, more than one fishing trip for a particular vessel. The observers shall not spend more time on board the vessel than is necessary to carry out their duties. At the time the annual advance fee is paid, the vessel owner shall also pay Liberia a flat-rate sum of EUR 400 per year for each vessel. The salary and social contributions of the observer shall be borne by Liberia. The embarkation conditions for the observer, in particular the duration of presence on board, shall be defined by mutual agreement between the vessel owner or his agent and the BNF. Observers shall be treated on board as officers. However, receiving the observer on board shall take into account the technical structure of the vessel. The vessel owner shall bear the costs of providing accommodation and food for the observer on board, including access to washing and toilet facilities, of a quality at least as good as that supplied to officers on the fishing vessel. The master shall take all the measures for which he is responsible to guarantee the physical safety and general wellbeing of the observer. take photographs of the fishing activities, including fish, gear, equipment, documents, charts and records, and remove from the vessel such photographs or film as the observer may have taken or used on board the vessel. respect the confidential nature of any document belonging to the vessel. The vessel owner or his agent shall notify Liberia, with a notice period of ten calendar days before the embarkation, of the date, time and port of embarkation of the observer. If the observer is embarked in a foreign country, their travel costs to the port of embarkation shall be borne by the vessel owner. If the observer does not arrive to embark within 12 hours of the date and time set, the vessel owner shall be automatically discharged from his obligation to allow the observer to embark. The vessel shall be free to leave the port and start fishing operations. Where the observer is not disembarked in a Liberian port, the vessel owner shall bear the costs of repatriation of the observer to Liberia as soon as possible. If the vessel does not arrive at the agreed time at the previously agreed port to receive an observer, the ship-owner shall pay the costs at a daily subsistence rate of EUR 80 for the number of days relating to the observer's inability to board while waiting at the port (accommodation, food, etc.). If the vessel fails to appear, without having provided the BNF and NFMC with prior notification, Liberia may take appropriate action in accordance with the applicable Liberian legislation. communicate observations by radio, fax or e-mail at least once a week while the vessel is fishing in the Liberian fishing zone, including the quantity of catch and by-catch on board. Before leaving the vessel, the observer shall submit a summary report of his observations to the master of the vessel, the content of which shall be agreed on by the Joint Committee. The master of the vessel shall have the right to make comments in the observer's report. The report shall be signed by the observer and the master. The master shall receive a copy of the observer's report. The observer shall send his report to the BNF, which shall send a copy of it to the Union within 15 calendar days of the observer's disembarkation. The information contained in the observer report may be used for both science and compliance analysis by the competent Liberian and Union authorities. Any infringement committed by a Union vessel holding a fishing authorisation in accordance with the provisions of this Annex must be referred to in an infringement or inspection report produced by the competent Liberian authority. The notification of the infringement and the relevant applicable sanctions served on the master or the fishing company shall be sent directly to the vessel-owner following the procedure set in the applicable Liberian legislation. A copy of the notification shall be sent to the flag state of the vessel and to the Union within 24 hours. The signature of the inspection report by the master shall be without prejudice to the vessel owner's right of defence in respect of an infringement. The master of the vessel shall cooperate while the inspection procedure is being carried out. Where permitted under the Liberian legislation in force regarding the infringement, any Union vessel having committed an infringement may be forced to cease its fishing activity and, where the vessel is at sea, to return to a Liberian port. Liberia shall notify the Union within 24 hours of any detention of a Union vessel holding a fishing authorisation. That notification shall include documentary evidence supporting the detention of the vessel. Before taking any measure against the vessel, the master, the crew or the cargo, with the exception of measures aimed at protecting evidence, Liberia shall organise, at the request of the Union, within one working day of notification of the detention of the vessel, an information meeting to clarify the facts which have led to the vessel being detained and to explain what further action may be taken. A representative of the flag State of the vessel may attend that information meeting. The penalty for the infringement shall be set by Liberia according to the provisions of the national legislation in force. In the event that the ship owner does not accept the fines, and provided that the infringement does not involve a criminal act, a compromise procedure shall be undertaken between the Liberian authorities and the EU vessel to settle the issue amicably prior to launching the legal proceedings. A representative of the flag State of the vessel and of the Union may participate in that compromise procedure. The compromise procedure shall finish at the latest three calendar days after the notification of the detention of the vessel. If the compromise procedure fails and the infringement is brought before the competent court, the owner of the vessel which committed the infringement shall deposit a bank security at a bank designated by Liberia, the amount of which, as shall be set by Liberia, shall cover the costs linked to the detention of the vessel, the estimated fine and any compensation. The bank security may not be recovered until the legal proceedings have been concluded. Liberia shall inform the Union of the outcome of the legal proceedings within eight calendar days of the judgment being delivered. The vessel and its crew shall be authorised to leave the port once the penalty has been paid in a compromise procedure, or once the bank security has been deposited. for the fleet of longliners, at least 20 % of the seamen signed on during the tuna-fishing season in the fishing zone of third countries shall be of ACP origin. The vessel owners shall endeavour to sign on three qualified Liberian seamen per vessel. The vessel-owners shall be free to select the seamen they take on board their vessels from the names on the list submitted by the BNF to the Union. The International Labour Organisation (ILO) Declaration on Fundamental Principles and Rights at Work shall apply as of right to seamen signed on by Union vessels. This concerns in particular the freedom of association and the effective recognition of the right to collective bargaining, and the elimination of discrimination in respect of employment and occupation. The employment contracts of seamen from the ACP countries shall be drawn up between the vessel owners' representative(s) and the seamen and/or their trade unions or representatives. A copy shall be given to the signatories, the BNF, the Liberia Maritime Authority (LiMA) and to the Ministry of Labour of Liberia. Those contracts shall guarantee the seamen the social security cover applicable to them, including life assurance and sickness and accident insurance. The wages of the seamen from the ACP countries shall be paid by the vessel owners. They shall be fixed, before fishing authorisations are issued, by mutual agreement among the vessel owners or their representatives and the seamen or their trade unions or representatives. However, the wage conditions granted to the seamen shall not be lower than those applied to their respective countries and shall under no circumstances be below ILO standards. All seamen employed aboard Union vessels shall report to the master of the vessel designated on the day before their proposed embarkation date. Where a seaman fails to report at the date and time agreed for embarkation, vessel owners shall be automatically absolved of their obligation to take the seaman on board. Where the Liberian seaman is not disembarked in a Liberia port, the vessel owner shall bear the costs of repatriation of the seamen to Liberia as soon as possible. If the vessel does not arrive at the agreed time at a previously agreed port to receive Liberian seaman, the ship-owner shall pay the costs at a daily subsistence rate of EUR 80 for the number of days relating to the Liberian seaman's inability to board while waiting at the port (accommodation, food, etc.). of non-ACP and non-Union countries. Beyond 12 nautical miles from the baseline, excluding zones closed to shipping and fishing provided for under Appendix 5. Compliance with ICCAT and FAO recommendations. Seamen: 20 % of seamen signed on are ACP nationals. Characters used must comply with the ISO 8859.1 standard. A double slash (//) and the characters ‘SR’ indicate the start of a message. Each data element is identified by its code and separated from the other data elements by a double slash (//). A single slash (/) separates the field code and the data. The ‘ER’ code followed by a double slash (//) indicates the end of the message. The optional data elements must be inserted between the start and the end of the message. The competent Liberian authorities shall notify the competent Union services, before the provisional application of the Protocol, of the geographical coordinates of the Liberian baseline, Liberian fishing zone and zones closed to shipping and fishing. The Liberian authorities shall also undertake to communicate any changes to those coordinates at least one month in advance. All Union vessels must be equipped with an electronic system (hereinafter referred to as ‘ERS’), capable of recording and transmitting data concerning the vessel's fishing activities (hereinafter referred to as ‘ERS data’), when the vessel is operating in the Liberian fishing zone. A Union vessel that is not equipped with an ERS, or whose ERS is not working, is not authorised to enter the Liberian fishing zone in order to engage in fishing activities. ERS data shall be transmitted in accordance with the procedures of the vessel's flag State, i.e. they shall firstly be sent to the Fisheries Monitoring Centre (FMC) of the flag State which will make them automatically available to the Liberian FMC. The flag State and Liberia shall ensure that their FMCs have the necessary IT equipment and software to automatically transmit ERS data in XML format and shall have a backup procedure in place capable of saving and storing ERS data in a format which will be computer-readable for at least three years. Any change or update to this format shall be identified and dated and must be operational six months after its introduction. ERS data must be transmitted using the electronic means of communication operated by the European Commission on behalf of the Union, referred to as the DEH (Data Exchange Highway). The flag State and Liberia shall each designate an ERS correspondent who will act as the point of contact. ERS correspondents shall be designated for a minimum period of six months. The FMCs of the flag State and Liberia shall notify one another of the contact details (name, address, telephone number, fax, e-mail address) of their ERS correspondent, before the supplier starts production of the ERS. Any changes to the contact details of the ERS correspondent must be notified immediately. transmit ERS data on a daily basis to the FMC of the flag State, according to the format referred to in point 3, by 23:59 UTC at the latest. The master is responsible for the accuracy of the ERS data recorded and sent. The FMC of the flag State shall send the ERS data automatically and without delay to the Liberian FMC. The Liberian FMC shall confirm that it has received the ERS data by means of a return message and shall handle all ERS data confidentially. The flag State shall immediately inform the master or owner of a vessel flying its flag, or their agent, of any technical failure of the ERS installed on board or breakdown in transmission of ERS data between the vessel and the FMC of the flag State. The flag State shall inform Liberia of the failure detected and the corrective measures taken. In the event of a breakdown in the on-board ERS, the master and/or owner shall ensure the ERS is repaired or replaced within ten calendar days. If the vessel makes a call at a port within those ten days, it may only resume fishing activity in the Liberian fishing zone once its ERS is in perfect working order, unless Liberia authorises otherwise. it receives authorisation from the flag State. In the latter case, the flag State shall inform Liberia of its decision before the vessel leaves. Any Union vessels operating in the Liberian fishing zone with a faulty ERS must transmit all ERS data on a daily basis and by 23:59 UTC at the latest to the FMC of the flag State by any other available means of electronic communication accessible by the Liberian FMC. ERS data which could not be made available to Liberia via the ERS owing to the failure referred to in point 12 shall be transmitted by the FMC of the flag State to the Liberian FMC by another mutually agreed form of electronic communication. This alternative transmission shall be considered priority as it will not be possible to comply with the transmission deadlines usually applicable. If the Liberian FMC does not receive ERS data from a vessel for three consecutive days, Liberia may instruct a vessel to immediately call at a port of Liberia's choosing in order to investigate. In the event that ERS data is not received by an FMC, its ERS correspondent shall immediately inform the ERS correspondent for the other FMC and, if necessary, work together in order to resolve the problem. Before the ERS becomes operational, the FMC of the flag State and the Liberian FMC shall mutually agree on the alternative means of electronic communication to be used in order to transmit ERS data in the event of an FMC failure, and shall immediately inform one another of any changes. If the Liberian FMC reports that ERS data has not been received, the FMC of the flag State shall identify the causes of the problem and take appropriate measures in order to resolve the problem. The FMC of the flag State shall inform the Liberian FMC and the Union of the outcome of the measures taken within 24 hours after recognising the failure. If more than 24 hours is required in order to resolve the problem, the FMC of the flag State shall immediately transmit the missing ERS data to the Liberian FMC via one of the alternative means of electronic communication referred to in point 20. Liberia shall inform its competent monitoring services (MCS) so that Union vessels are not considered by the Liberian FMC as being in violation of their obligations for not transmitting ERS data, owing to a failure in one of the FMCs. Planned maintenance of an FMC (maintenance programme) which may affect the exchange of ERS data must be notified at least 72 hours in advance to the other FMC, indicating, where possible, the date and duration of the maintenance work. Information about unplanned maintenance work shall be sent to the other FMC as soon as possible. During the maintenance work, the provision of ERS data may be put on hold until the system is operational again. The relevant ERS data shall be made available immediately after the maintenance work has been completed. If the maintenance work takes more than 24 hours, ERS data shall be sent to the other FMC using one of the alternative means of electronic communication referred to in point 20. Liberia shall inform its competent monitoring services (MCS) so that Union vessels are not considered by the Liberian FMC as being in violation of their obligations for not transmitting ERS data, owing to the maintenance of an FMC.